I'm hooked on Amigurumi, but it is taking on a life of its own! As I am making up my designs as I go along, some of these characters take some unpredictable turns. I started out making a monkey, but made the head too flat. My kids told me that it looked like a muffin, so I soldiered on and made a muffin cup to go with it. My eldest informed me that this was no muffin, but a cupcake. On his recommendation I added stitched on sprinkles. My husband declared that it was instead a toadstool. The monkey who became a toadstool. I set out to make a monkey the second time, but I made the nose too pointy and placed the ears in the wrong spot. There was nothing else to do, but make a mouse tail and nose and call it good. Finally, I decided I would crochet a bowl of ramen noodles. I felt pretty confident that things would go my way. I made the bowl out of a head pattern and folded it in to make a thick shell. I also made a disk with a cut up yogurt lid in the center to give the bowl stability. I sewed in some yarn loops for noodles, and made a shrimp out of shrimp colored yarn, attaching some chains at the end for legs. When I proudly presented my crocheted ramen to my family, they said, "That's not ramen, mom. Those are soba noodles!" It’s best to have one or two activities and maybe a 3rd one for a backup. That way you can really focus on the project at hand; discover its pitfalls and possibilities. I think it’s better to spend more time on a quality product than spread yourselves thin on several activities. Think success. At the end of our afternoon, everyone walked away with beautiful greeting cards and wrapping paper. In terms of the projects themselves, you want to keep it simple. For the cards, we focused on collage. I had magazine cuttings, ribbons, feathers to put on the cards. I also had some holiday rubber stamps, crazy scissors and glue. The kids started on their cards right away. As they progressed, they started sharing ideas and materials. When the action started to slow down, I added a few pointers. I showed the girls how to make a fairly simple pop-up card and they used the basic ideas to create their collages in 3-D.
For our second activity, we put butcher paper on the floor and had the kids use stamps and pens to make wrapping paper. We could use some of the same materials for this project, including the magazines for collage. The Crafternoon can take many forms depending on the skill level of the crafters. The cards and wrapping paper could be done with very young children. Projects that involve glue guns, tools, exacto knives would be more appropriate for an older crowd. Crafternoons don’t have to be for kids--a grown-up crafting event could be just what the doctor ordered! Doing a craft and teaching a craft are two different things. I find it’s better to teach something I know really well, as I have had a chance to make LOTS of mistakes and find the pitfalls at each stage of the project. I usually spend some time doing the project and thinking it out step by step as I go. I might also include examples of various stages of the craft. For example, in teaching how to make gift bags, I have a bag before it’s glued, another with the sides only glued and then a completed bag. It’s important for me to show how I got there. A little rehearsal can go a long way when you are teaching a craft. For my Crafternoon, I set out my grandmother’s dining room table with all the leaves extended to create a spacious work area. Since we were going to be gluing and stamping, I put down vinyl tablecloths. I set up a couple of stations of materials which included scissors, rulers, glue, pens, hole punches. I tried to spread out the collages materials to keep them accessible. This keeps passing back and forth and reaching over each other’s projects to a minimum. Having done a lot of paper crafts, I know how many scraps can get thrown around in the process of a project. I had three bins ready : recycling, reusable scraps, and garbage. Don’t forget to plan for the occasional emergency. I put down the vinyl tablecloth for the cards, but if we had been using paint, I might have to protect the floor also. You’ll be more relaxed for the whole experience if you cover your bases. Definitely plan some time for clean-up. It will be easier if you do some clean-up between projects rather than wait until the end. If you’ve done a good job preparing it will be easier to rein it all in. I had bins for scissors, glue, and rulers set up on the table so that the items had a home at the end of the day. For kids, it’s a good time to review taking care of your materials. Put the caps on the glue sticks, put the lids on the stamp pads, etc. Also, to prepare crafts to be taken home, you might need bags, boxes, or envelopes on hand. I had the kids put their names on big envelopes to take their cards home in. I also had rubber bands at the ready for securing the rolled up wrapping paper. If you’ve done all your homework, it should be a very successful Crafternoon! Play some music, have some simple snacks available, take time to admire each other’s work. Have a show-and-tell after everything is cleaned up. 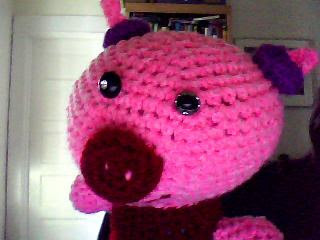 The other day I went to Twisted on Broadway to take a class in Amigurumi, the art of crocheting super cute characters. (Also the name of the book we used). The instructions in our book were in Japanese, but the patterns were so visually oriented that it was easy to figure out what to do. Great for those who absorb information in that way. It's all done with single crochet, decreases and increases. Once you learn the basic design, it's easy to branch out and come up with your own ideas. There is no limit to the acute cuteness you can achieve!